The SKAddl-compact linear direct drive servomotors are ideally suited to small volume and special purpose machine builders. Supplied ready-to-fit this linear servomotor range does not require the lengthy design in associated with linear motor technology. The linear motor can be specified with the required length, power rating, feedback device and resolution... even down to the required cable lengths and temperature sensor. The complete unit is then pre-assembled at the factory and shipped ready-to-install. The SKAddl direct drive motors are particularly suited to applications where high-speed motion with high-positioning accuracy are demanded. The direct drive technology, besides eliminating backlash and mechanical elasticity in the drive transmission, drastically lowers maintenance costs while achieving appreciable energy savings through improved overall efficiency. The SKAddl-compact series of ready-to-fit linear servomotors are easy to integrate, thanks to the enclosed, extruded aluminium housing. Standard lengths are available up to 3.5m and force rating are 1600N continuous / 4800N peak. 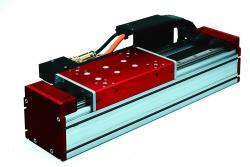 The SKAddl direct drive linear servomotor series offers a variety of construction options to suit small to high volume machine builders. The SKAddl motors are available with up to 2400N continuous and 7800N peak force and maximum speed of 5m/s.